Have you ever wonder what are in the food you put into your mouth? How fat is ‘low fat’? How sweet is ‘no sugar’? Have you ever wonder who are the people behind those processed or frozen food? Have you ever thought of processed and frozen food can be tasty and healthy too? A Bachelor of Science (Hons) Culinology® will enable one to develop tasty recipe into processed and frozen food for the people who are busy with their everyday life, yet are constantly seeking for easy way to enjoy tasty food. The term ‘Culinology®’ was coined by the U.S. based Research Chefs Association(RCA). Founded in 1996 by a group of research chefs working in the food product development industry, the association has witnessed the growing trend for professional chefs to become intimately involved in the research and development process. Traditionally, it was food scientists who have been at the forefront of developing new products for the mass market, with a focus on food preservation and commercialisation. Graduates can be called a Culinologists®, and have the option to work as as Chef Consultant, R&D Manager or R&D Chef, Hygiene Consultant, Quality Manager, Sensorial Analysis Manager, Corporate Chef, Corporate Executive Chef, Test Kitchen Chef and other similar positions in the food industry. During last weekend Taylor’s University open day Culinology® in Action event, I was able to learn more about Culinology® and the program it is currently offered in Taylor’s University as Dr. Benjamin Wong a lecturer whom is teaching the first batch of Culinology® students explains in detail about the course and it’s history. Here are 3 of Taylor’s University first batch students taking Culinology®. The Culinology® programme offered at Taylor’s University is the first complete Culinology® degree to be offered outside the USA. It is not a transfer programme where students study few years in Malaysia and must then transfer to a foreign university. The entire programme is conducted at Taylor’s University Lakeside Campus. It is offered under Taylor’s University School of Hospitality, Tourism and Culinary Arts (TCHT) One must possess an interest in Chemistry to pursue the programme. It is a three year programme with two internships. Students will need to be in the kitchen and the lab and need to produce a real product by the end of their studies. In a nutshell thats basically what Bachelor of Science (Hons) Culinology® in Taylor’s University, for more information about the course get the soft copy course prospectors download PDF here. After the briefing, we had the opportunity to witness Culinology® in Action, Chef Sharizan making mayonnaise by mixing egg yoke with oil. I’ve never imagine it’s so easy to make mayonnaise plus it’s thick and tasty as compared to the bottles of mayonnaise sold in supermarkets in such dilute form! The experiment here is to make eggless mayonnaise for people who are sensitive to egg and couldn’t enjoy mayonnaise as much as some of us do. If you look at the picture, the white creamy texture on the first bowl is the eggless mayonnaise mixed with emulsifier. 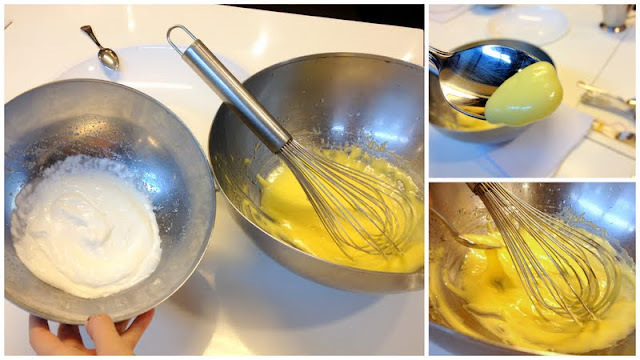 The texture looks exactly the same as mayonnaise with egg as colour wise the original mayonnaise is in the form of yellow-ish due to egg york however by adding alot of water and emulsifier as sold in the supermarkets made the mayonnaise white in colour! Though the team are halfway through the success of eggless mayonnaise the taste varies in huge difference and taste horrible. Guess it will take a much longer time to invent an eggless mayonnaise.So you see, being a Culinologists® your like a food scientist. Experimenting in the lab as well in the kitchen on food. It could be a very interesting pathway if you have passion for food and love for science in invention or of new creation. To celebrate the launching of the Culinology® Chronicles, Taylor’s University is honored to introduce the first edition of TAYLORS CULINOLOGY® CONTEST. You stand a chance to win great prizes worth more than RM 15000, participants must answer a series of 10 questions, designed to test their knowledge on Culinology® and the Chronicles website and suggest a slogan for the Culinology® Chronicles – it’s just that simple! For more details about the contest visit contest page here. To participate in the quiz where you can win tuition waiver to study Culinology® programme join the contest here. Hurry, contest ends 12 August, 2012. I’ve certainly learned more about Culinology® with Feeq at Taylor’s University during the Open Day event of Culinology® in Action. Bachelor of Science (Hons) Culinology® next intake starts in August 2012! For more information on Culinology® do visit www.culinologychronicles.com and Taylor’s University at www.taylors.edu.my/en/university. 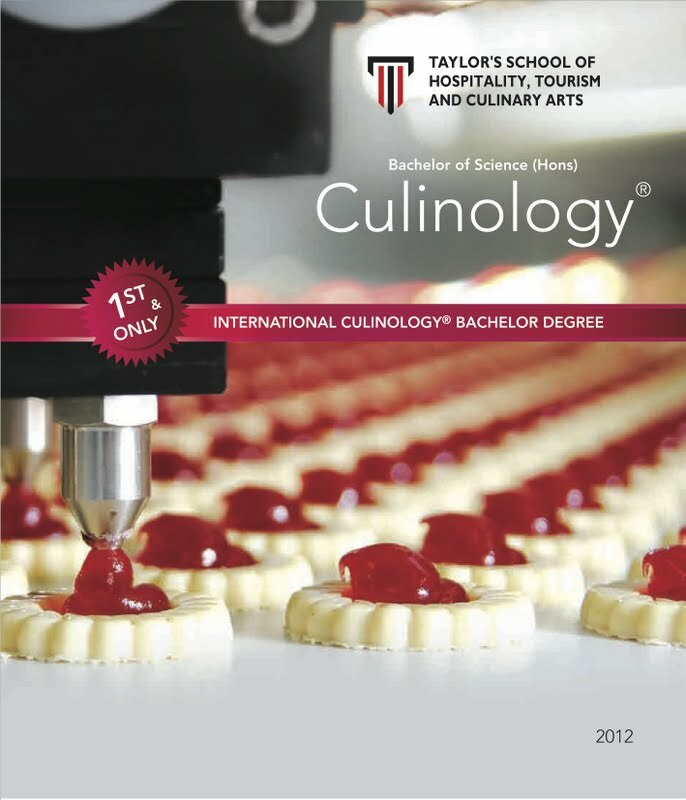 1) Is there any other institution that offers Culinology® programme in Malaysia or even in South East Asia? Culinology® programme offered at Taylor’s University is the first complete Culinology® degree to be offered outside the USA. It is not a transfer programme where students study few years in Malaysia and must then transfer to a foreign university. The entire programme is conducted at Taylor’s University Lakeside Campus. 2) What are the other universities offering Culinology® programme? Various prestigious universities are offering a Culinology® degree programme in the United States. Full list of univesities offering Culinology® programme here, http://www.culinology.com/rca-approved-programs. 3) Can I transfer to another university to complete the final year? Yes, students will be given the opportunity to transfer to selected Taylor’s University’s partner universities to complete their final year study. 4) What is the difference between Taylor’s University’s Bachelor of Culinary Arts & Food Service Management (Hons) and Taylor’s Bachelor of Science (Hons) Culinology®? Although these two bachelor degrees are related to culinary studies, they are extremely different in many ways. The Bachelor of Culinary Arts & Food Service Management (Hons) has been designed to prepare chefs to work for the restaurants and hotel industry, who not only have competencies in cooking but also in managing and running a food service business. The Bachelor of Science (Hons) Culinology® is designed to produce R&D chefs, who are able to create recipes that can be mass produced in a manufacturing company. Culinology® graduates will end up working for the food industry in companies such as Nestle, Unilever, etc. A look at the subjects taught in both programmes will clearly illustrate the differences between the two (food processing, packaging) and R&D subjects (food product development etc). 5) What is the difference between Taylor’s University Bachelor of Science (Hons) Culinology® and Taylor’s University’s Bachelor of Science (Hons) (Food Science & Nutrition)? The Bachelor of Science (Food Science & Nutrition) is a pure science stream programme that has been designed to train food scientists who are able to conduct research on food and food components. Graduates from the Bachelor of Science (Hons )(Food Science & Nutrition) are not meant to create new recipes for new food product. They are usually employed by food companies to assist in processing and mass producing the recipes created by the graduates of Culinology® employed as R&D chefs. A look at the subjects offered help to understand the differences between the two programmes. 6) As a student, can I become a member of the Research Chefs Association (RCA)? Yes. Once you enrol into the Culinology® programme, you will automatically become member of the RCA. You will enjoy all the benefits as a member, which include full access to the RCA website, receiving RCA newsletter and magazines, etc. Yes, you will. You will be able to give yourself the title of Culinologist® or R&D Chef which is more commonly used in the food industry. Different countries sometimes have different designations for R&D chefs. The title Research Chef is, for example, the most common one. After a few years of working experience, students who graduated from a Culinology® programme can choose to sit for a test to become a certified culinologist. The certification is rewarded to professionals who have acquired a strong expertise throughout their working experience, entitling them to be recognised as certified Culinologist. Graduates from the Culinology® degree need a minimum of five years working experience to be eligible to sit for the certification test. For further information on the certification, visit the RCA website at http://www.culinology.com/certification. 8) Is there a promising career for a Culinologist®? The food industry is one of the largest industries in the world and an industry that is most unlikely to disappear. The need of processed food is constantly increasing with a demand for a global market that is increasingly looking for convenience foods, and spending less and less time cooking. Moreover, many modern health concerns force food manufacturers to create new products with lower sugar content, sodium content, fat content, etc. The food industry is highly competitive, forcing many companies to look out for experts who are able to assist them in creating new food products to meet the ever-changing market demands, that can be mass produced at the most affordable price.